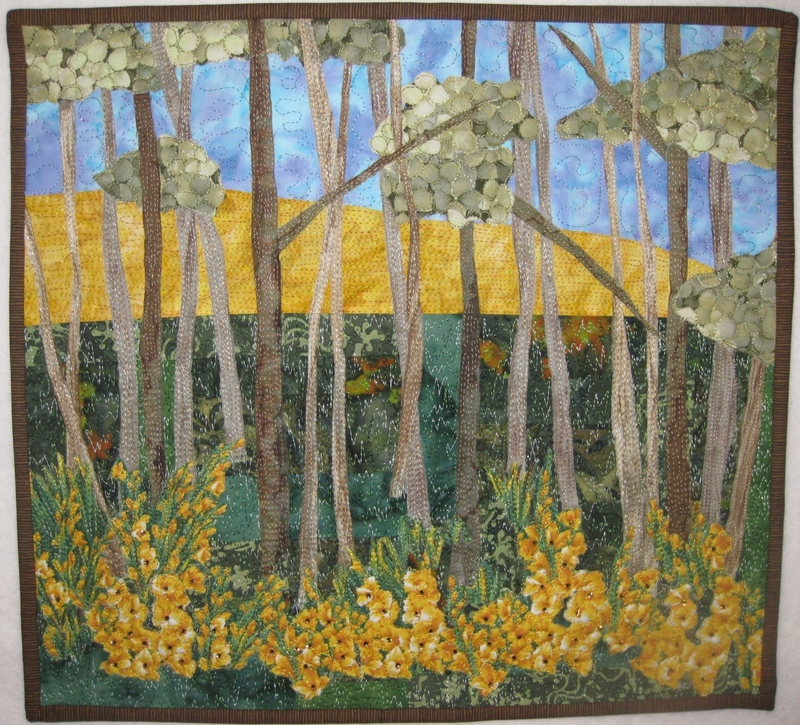 My latest landscape quilt is finished. 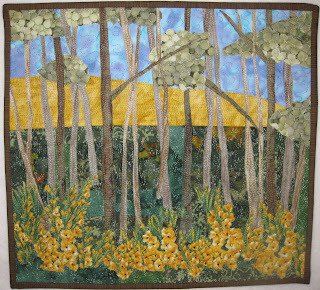 This quilt was created for a class on art quilts so my friends can practice selecting fabrics, composing a scene, painting with thread, etc., always keeping in mind that art quilts can be as true to nature or as abstract as one desires. This one measures 15 1/2" x 17", a good size project for an all day class. I would like to add an animal, but will need to let it hang on my designing wall for a few more days before I figure out what animal, its size, and where it will go. Crystallized elements bring light to the flowers on the forest floor. As you can see from this detail, I used raw applique technique, first gluing the pieces of fabric to a pieced background. 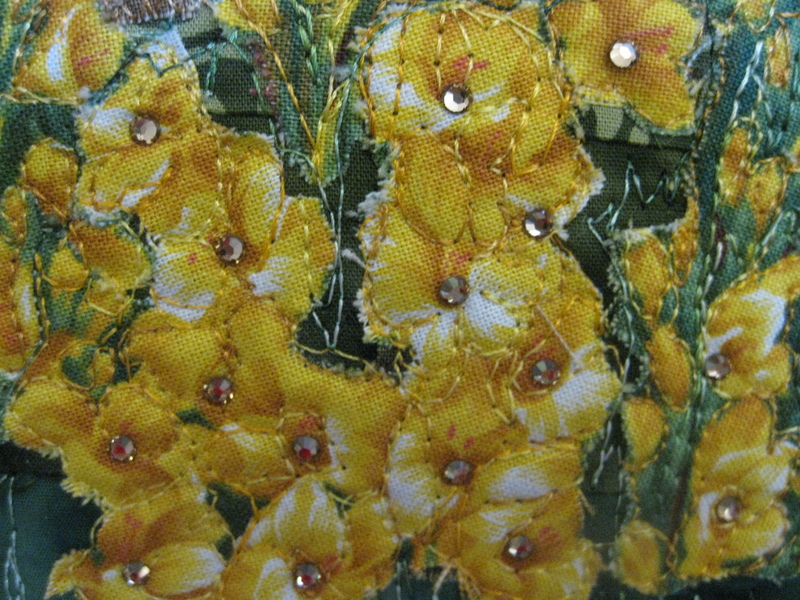 Once the sandwich was assembled, I worked with my favorite threads by Superior Threads. I used 6 different variegated colors from the Rainbows line. Very pretty! Following you from MBC and hope you will please follow me too:) Thank! Very beautiful! My mother made wonderful quilts, but never seemed to pass the skill on to me :) I am artistic though-I was a professional dancer when I was younger, so I at least inherited that from her! New follower from MBC, I look forward to your future posts! Beautiful work! I am following through MBC and I would appreciate a follow back. wow..that is absolutely gorgeous! You have talent!! my daughter was in charge of a quilt exhibit in Lancaster Pa...what amazing quilts..beautiful. Your work is so inspirational. Obrigada pela visita e sem duvida estarei retornando para mais ideas. Mal posso esperar para ver o animalzinho que sera acrescentado ao seu Landacape Mini Quilt. I love the little crystals that were incorporated! I'm following you back! Yay! This is so pretty...and talented. Hi, I'm so glad to have found your blog. Wow! You're landscape quilt is gorgeous! I don't have the courage to attempt anything like this, but truly admire those who do. I'm no following you and can't wait for the next beauty you create. You're so talented! The wall hanging is absolutely gorgeous!